Jessica Venable has primary responsibility for overseeing the Research Universities & Institutions Practice, in which she strategically addresses the needs of client organizations with high research activity. Drawing on more than 15 years of experience in sponsored research and program management, Dr. Venable provides clients with advice and support to develop relationships, identify appropriate funding opportunities, and apply for funding at federal agencies. Prior to joining McAllister & Quinn, Dr. Venable was Coordinator for Research Development Services at Virginia Commonwealth University (VCU), where she provided individualized research and proposal development assistance to faculty; assisted in the development and submission of high priority institutional grant proposals; and, created and organized numerous grant training programs that significantly improved the University’s return on investment. 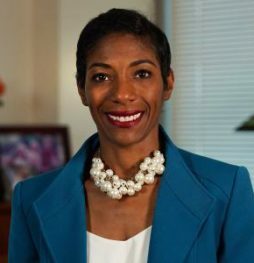 Including her nine-year career at VCU, Dr. Venable has worked consistently in the fields of sponsored programming for education reform in areas serving high populations of underrepresented ethnic minorities (including Historically Black Colleges and Universities, Hispanic Serving Institutions, and tribal communities). In her role as a Program Officer at the National Alliance of State Science and Mathematics Coalitions, she served as the staff liaison to coalitions of state business, public policy, and education organizations partnering for STEM education reform. Before that she was Program Manager at the George Washington University Center for the Study of Globalization and previously was a Program Associate of the Grants Resource Center at the American Association of State Colleges and Universities, where she provided personalized pre- and post-award technical assistance to administration and faculty of more than 25 state colleges and universities in the southeast states. Additionally, Dr. Venable previously held research positions at the National Aeronautics and Space Administration (NASA) and the American Association for the Advancement of Science (AAAS). Among her professional and community activities, Dr. Venable has served as a grant reviewer for the Department of Education, NASA, and the Department of Housing and Urban Development. She is active in a number of professional organizations, including the National Organization of Research Development Professionals (NORDP), where has served in various committee roles. She also has served as a coach in the Association of American Colleges & Universities “Preparing Critical Faculty for the Future (PCFF) 2” program, and she is currently Co-Lead Judge with the Emerging Researchers National Conference in STEM, a program hosted by the AAAS and the National Science Foundation. Dr. Venable earned her Ph.D. (Education, Research and Evaluation Track) from VCU. She earned her M.A. in education from George Washington University and her A.B. from Princeton University. Dr. Venable develops and leads training on effective grant writing skills, helping researchers to develop the sales and storytelling skills necessary to make their grant proposals understandable, clear, and measurable, and to effectively understand and respond to reviewer comments. She has run over 100 sessions across leading academic institutions as well as non-profit organizations pursuing funding opportunities. In her facilitation, Dr. Venable takes a ‘coaches approach’ to training,helping groups to self-discover appropriate solutions, challenging them to find different ways of presenting information, and ensuring that the techniques provided are understood and can be applied outside the classroom. Dr. Venable’s courses are frequently described by participants as ‘the best training in grant writing I have ever taken’, and ‘incredibly useful to my ongoing professional development’. Dr. Venable has authored and co-authored numerous presentations and peer-reviewed articles on a broad range of topics in professional journals such as the Journal of Child and Family Studies, International Review of Qualitative Research, and Practical Assessment, Research & Evaluation. She has also been a workshop leader and presenter at various meetings of professional research associations, including the American Educational Research Association and the University Council for Educational Administration.